‘The banks got bailed out, the public got sold out. That’s what happened ten years ago when the collapse of one private financial institution in the US caused the biggest global recession since the Great Depression’ writes Rachel Oliver, Head of Campaigns and Organising at Positive Money in this article featured in the RSA. Any gains from the fallout that followed were privatised while the cost was nationalised. Our politicians bailed the bankers out with hundreds of billions of pounds of public money, then told us there wasn’t any money for public services or investment in our futures. In other words, billions of ordinary people paid the price for the behaviour of a small number of reckless, greedy men and a broken system that, rather than serve society, extracts wealth, energy and hope from it. And ultimately, one could reasonably argue, as Mark Baum says in The Big Short, it’s “immigrants and poor people” who have taken the brunt of the ill feeling sporn out of what was a catastrophic failure of modern society. You see, the economy is not a faceless machine that functions and delivers in inevitable, mysterious or inalterable ways. The economy is us: you, me, our neighbours, colleagues, towns, cities, and the ways we choose to behave and interact with each other. It’s a system designed by and lived by humans. But now it is a system that no longer works in the interests of the vast majority of those humans. So, it’s time we redesigned it. It’s time we changed our behaviour towards one another. The financial crash of 2007/8 exposed the worst behaviours symptomatic of the system we have created; greed, recklessness, and a total disregard for the impact of these behaviours on other people’s lives. Arguably, what followed exposed the very worst human behaviour by our political elites. Because where there were clear lessons to be learned and changes needed to avoid another catastrophic collapse, they chose not to learn those lessons or make the changes so desperately needed by our fragile society. Instead they chose to further their own narrow interest and misguided ideology. 10 Years On is a coalition of civil society groups which have come together in 2018 around the tenth anniversary of the financial crash to say enough is enough. We are economists, journalists, students, activists, grandparents and more. We are fed up with a banking system that is fuelling inequality, poverty, unaffordable homes, debt, insecure jobs and dirty energy. We are fed up with one rule for the big banks and another for the rest of us. We are fed up with politicians and governments who don’t understand or refuse to make time to understand how an economy really works. 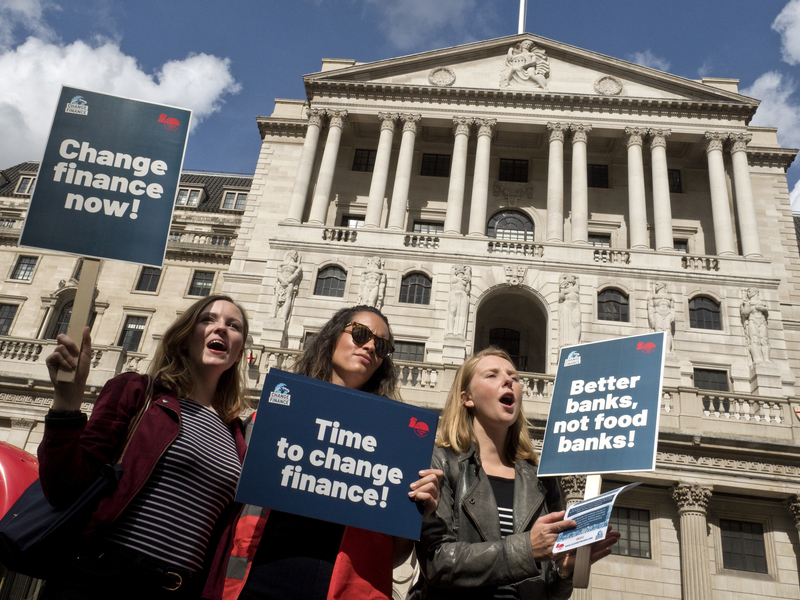 Together with fellow groups around Europe and the world, we are calling on our politicians to wake up and to change finance now. 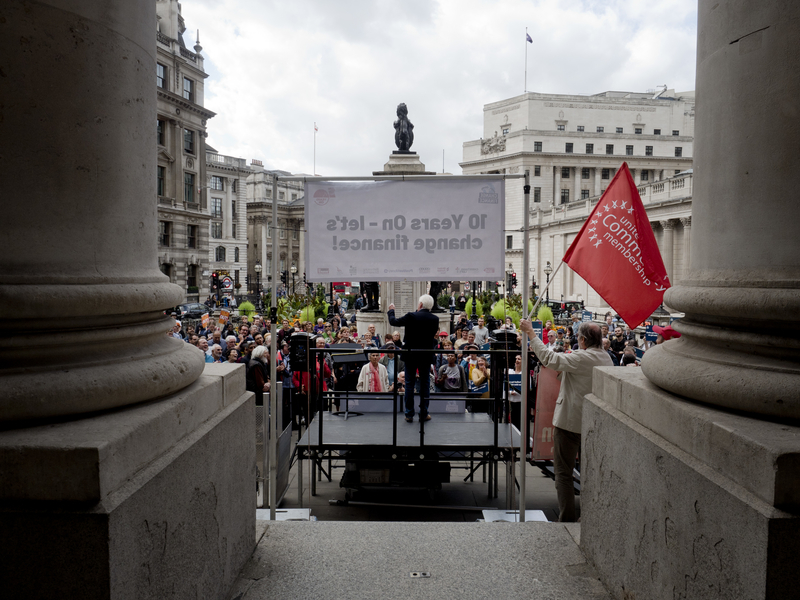 One of the flagship events of our campaign so far was a rally outside the Bank of England on 15th September, the day Lehman Brothers collapsed ten years ago. What was curious about the media packages and journalists who covered the rally and interviewed us – BBC Radio 4, Sky News, LBC, Channel 4 News – was how receptive they were to what we had to say. And is this any wonder, when two thirds of Britons don’t trust banks to work in the best interests of UK society and are worried that banks may cause another financial crisis? Over the last ten years, politicians have failed to take sufficient steps to change the financial system. The financial system is no less risky now than it was then and the problems which caused the last crisis have not been fixed. Banks are still lending predominantly to property and are leveraging a huge amount of debt on a gamble that house prices will only increase. There is a ticking household debt time-bomb. After a decade of stagnant wages, UK households spent £25bn (£900 each on average) more than their incomes in 2017 to make ends meet. Household debt is at its highest level in history. The banking system is too concentrated and complex, with the largest three banks owning over half of bank assets. The climate crisis poses serious risks to the financial system. The elephant in the room is the writing down of the value of assets based on fossil fuels which need to remain unused or there will be dangerous temperature rise. Banks are neglecting local communities. Banks are closing branches across the country, putting people out of work, and failing to provide communities with access to services. Ultimately the big banks are more interested in investing in property and financial assets than serving communities and backing small and medium sized businesses. We want the finance sector to pay its fair share. The government should modernise the UK’s current stamp duty on shares to raise an extra £25 billion over the course of a parliament – by closing loopholes and extending the tax to other assets, such as derivatives. The Chancellor could introduce this in his next budget – not only could the extra money be used to help reverse cuts to vital public services, it would also make the financial system more stable by reducing the amount of high frequency trading. Just one year’s revenue would plug the NHS and social care funding gaps, fund 50,000 new genuinely affordable homes and 20,000 new teachers. The government needs to fulfil its promise to end ‘too big to fail’ banking. Currently, the system is more concentrated than ever. Given the level of risk to the financial system remains the same as it was ten years ago, the government ought to act without delay. Rather than a handful of mega-banks which serve global financial markets, we need smaller, regional banks rooted in local communities and employing local people. The government should mitigate this risk by breaking up the banks, starting with publicly-owned RBS ensuring no further job losses. An unseen consequence of stagnant wages has been the rise of household debt to its highest level in history. Families have now racked up a staggering £19 billion in debt on everyday bills, many living in fear of the bailiffs. A practical step for the government to take is to write-off problem debt for those households that have already paid 100% of their principal in interest. New measures to stop bank branch closures and to protect the public’s access to cash. The government should stem the closure of bank branches to protect jobs, making the provision of branch access a requirement that is written into banking licences. Since many companies are valued based on fossil fuel reserves which cannot be exploited without breaching global emissions targets, the threat exists that over time those reserves will be rendered worthless. The government needs to manage the financial system to transition away from fossil fuels and towards the green economy without sparking a financial collapse. At the heart of the change we want to see is the financial sector returning to its role as a utility that serves society, with its powers reined in so it is under effective control of government, and the sector’s incentive to earn rewards reoriented to facilitating long-term investment rather than through gambling. Millions of families are worse off now than they were before the financial crisis. A whole generation of young people have been robbed of their chances of a secure job, an affordable home, a sustainable future and the same quality of life as their parents. This year that generation is demanding better from our politicians. We’re demanding a system that serves us, not drains us. We’re demanding they act now to prevent another financial crisis which we simply cannot afford and do not deserve. The question is will they rise to the challenge? You can read the article on the RSA website here. Nonhlanhla is working on building youth engagement with Positive Money’s message. She has recently graduated from an International Relations degree from SOAS, an institution that introduced her to economics that benefits the whole of society. Nonhlanhla has a passion for educating and giving young people a platform to become active agents in shaping society for the better.